Almost two years ago, Kasey Anderson opened up in depth here about his spiraling descent from artist-on-the-cusp to grifting, locked-up addict. He was then not quite a year post-prison. And while there was still a hint of an artist’s confidence about him, it was tempered by the gun-shyness you’d expect of a guy fresh from the halfway house and with a long list of pissed-off victims, many of them former friends. Little did he know that within a couple of months he’d begin the long, cathartic and ad hoc process of recording a comeback album. 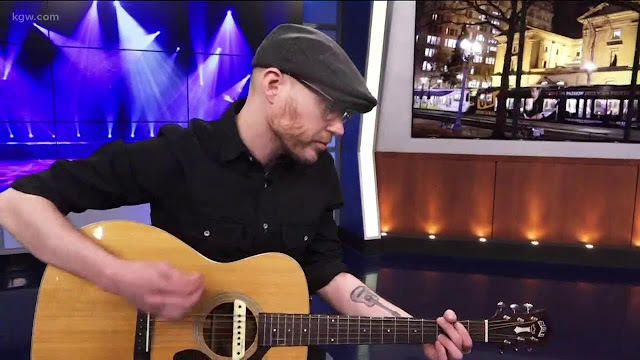 In fact, he really had no clue what would come of the sessions, done virtually pro bono by a collection of generous friends and musical colleagues from the Portland indie scene. Anderson’s voice on the telephone is stronger today. He sounds healthier, no doubt buoyed by the album-making process that was critical to his ongoing restoration as a man. The humility is still there, no doubt, but the knowledge that he’s made a really solid rock ‘n’ roll record has put a spring in his step. From A White Hotel, released today on emerging label Julian Records, is poignant, introspective and sprinkled with Anderson’s trademark irony, starting with the title, a reference to his drab lodgings for more than two years. Oh, and his name isn’t on it. We caught up with Anderson with just a few days to go before his nuptials, and talked redemption, recovery, the virtues of not being preachy, and the inevitable Steve Earle comparisons. And the whole, stupid “outlaw country” thing. Ha! No. First, I decided to do it under a band name because of the way the record came together. I had written all the lyrics and had the structure of the songs, but the instrumentation came together in such a collaborative way that it felt disingenuous just to put my name on it. And The Honkies, I didn’t want to go back to that because all those guys were such strong personalities in their own right, and I just kinda wanted to leave it there with those guys because I have such fond memories of that band. And I love that Neil Young record. 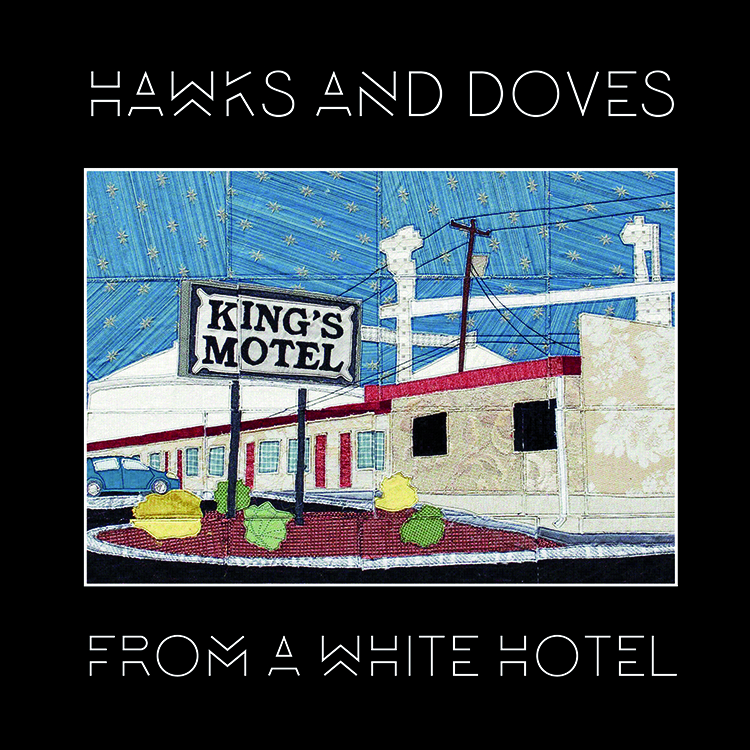 The phrase “hawks and doves” is a political and military term. It seemed pretty appropriate for what’s going on now. Plus, it just sounds cool. Yeah, yeah! From The V Roys! And since it’s not “Kasey and the Hawks and Doves,” just the band name, any concern that nobody will know it’s you? I don’t think it’s a horrible thing for me to make a clean break with the work that I did and the life that I led as a solo artist. It wasn’t a calculated move to do that; maybe it’s an added benefit? And I think that the way it’s being marketed through the press, it’s pretty clear that it’s a band I’m involved in. This is a collection of a dozen pretty dang good songs. How long have they been percolating? Did some of these words get put to paper while you were locked up? Yeah, about half of them were written while I was locked up, during my second year in prison. “Every Once in a While,” for instance, is about my first cellmate. That’s his story much more than mine. The other five or six songs happened around after the election, in late 2016. It took us a long time to make the record because of the way we went about it. 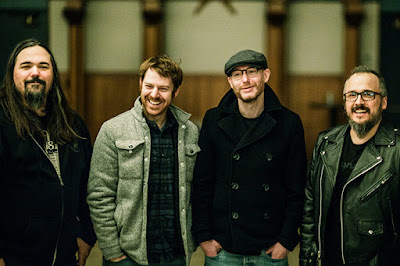 Tell me about this band, and how you got the record made; I imagine raising funds to get an album done might have been challenging for someone in your position. The band is Jordan Richter (guitars,) Ben Landsverk (bass, keys, viola, background vocals) and Jesse Moffat (drums, percussion). Other folks who played are Eric “Roscoe” Ambel, Kurt Bloch, Ralph Carney, Kay Hanley and Dave Jorgensen. …I wasn’t gonna say anything. It was a real thing, though, right? And that’s what we did. Jordan would text a group of us that said, “I have this day where the studio’s not in use, and you don’t have to pay me for the time.” So it took us more than a year, because we’d do a day here and there, and everybody would go back to their lives. So that’s how the record got made, and it was really generous of him to do that. And then I sent [the album] to several of my friends and said, “I really don’t know what to do with this; I can’t put it out.” I have a friend named Nathan Earle here in Portland who’s in a band called The Get Ahead, and he told me about this new label, Julian Records. “They seem to be looking for bands,” he said. “Why don’t you send it to them?” I had planned to just try and put it out digitally, but the Julian Records folks were into it, and took it from there. When last we spoke, we touched on your being medicated for bipolar disorder, and how that can sometimes stifle creativity in artists of all stripes. There’s a line in “Lithium Blues” that says, “You took the words right out of my mouth.” Is there a balance you find yourself having to strike between mental health and creativity? Yeah, for sure. “Lithium Blues” might have been the first thing I wrote in prison that I was really happy with. I had to go back and figure out, okay, there’s an element of magic to creativity, but there’s a much bigger element of math to it. And I know how to make a song so that the pieces fit together. If I can trust myself enough to do that, the rest will come along in time. That’s kind of what that song is about. We talked about this a little bit before, but I had almost resigned myself that [playing music professionally] was behind me, that maybe I could do some shows for fun from time to time. But over the course of making this record it became clear to me that I still know how to make a song work. Whether this is a thing I get to do on a larger scale remains to be seen, but I was able to prove to myself that I can still put a good song together, even when I’m not up for five straight days. An article in Glide mentioned that you’re training to be an addiction counselor. Is there some sense of duty there? Have you become more zealous about “the program” and living clean? Maybe a little of both? It’s a little of both. I have certainly become more zealous about making sure that people who deal with mental health and/or addiction issues – especially younger people – have someone they can talk to without feeling judged or dictated to. The name of your band, as you mentioned, has political overtones, and there are some references to current events on the album. But you didn’t lose your mind and start bashing people over the head with your opinions, like so many artists have done since 2016. Why do so many folks make everything about politics? When I wrote these songs, one of the things I tried really hard to do was invite people into a conversation rather than dictate to them how they should feel about any given thing. I really feel that’s a far more effective way to engage an audience, if you want to have that conversation. I have never responded to anybody – even when I agree wholeheartedly with what they have to say – addressing whatever they imagine their audience to be, by dictating what their thoughts or beliefs should be. That just doesn’t work for me, and when I wrote these songs I tried really hard to stay away from that. I wanted to ground it in narrative and open-ended conversation. Yeah. It’s there, but it’s not preachy, and it’s open to interpretation. And believe you me it’s refreshing. Because I didn’t vote for the sumbitch, but I’ve had about a bellyful of being preached to by guys whose music I otherwise love. Switching gears, redemption is certainly a theme running through From a White Hotel. How cathartic was this whole process, and where are you on the whole making-amends thing that started when you got out of the joint? Well, in terms of the process being restorative, the making of the record – playing music with other people, being able to work on songs – was really, really healthy. And it was good to do it in a way that I didn’t have to feel like my life depended on whether people liked these songs. Obviously I wouldn’t have put the record out if I didn’t want people to hear the songs, but it’s not going to ruin my life if there’s a deafening thud when it’s released. I’m still gonna be married to this wonderful woman, I’m still gonna be helping people who struggle with mental health and addiction issues. At the end of the day, the act of making a record was rewarding in and of itself. The amends thing? Well…the second you say you’re humble, you’re not. Ha! I guess that’s true. (Laughs) Yeah. I’ll just say I’m really proud of the work that I’ve done. I think I’m living out amends to people to whom I can’t make direct amends. I’ve worked really hard at doing a good job of that. By the time this article runs you’ll have been married for about a week. Was Caitlin a part of your life before you went away? How big a part of your road back to normalcy has she been? She was a part of my life. She wasn’t my girlfriend at that time, but she was part of a close group of friends. My girlfriend at the time was named Tracey, and she called Caitlin that night and said, “You’re not gonna believe this, but he’s gone. He’s going to prison, so can you come get his stuff out of my apartment?” So Caitlin went and got all of my stuff and took it to Goodwill in East Los Angeles. A lot of us had drastic changes in our lives around that time but we all stayed in touch for the most part. And Cait and I stayed in touch while I was locked up, and she’s been so supportive. She was never judgmental. It’s been one of the most positive things in my life – if not the most positive – to have that person with me every step of the way. On the title cut you say, “I ain’t no kind of outlaw, and I never claimed to be.” The wit and irony are strong in you, Kasey Anderson. Oh, wait! Gosh, see, there’s so much irony I missed the irony. I was thinking in the literal sense, in that you’ve done time and technically are an outlaw. Speaking of outlaws: Everybody’s favorite badass, Steve Earle, gets a nod on “Clothes Off My Back,” right down to the title of his 1996 post-prison album. I can understand why you could maybe not resist a tip of the ol’ driver’s cap; it’s just too perfect. But aren’t you afraid he might get a big head over it? Um…no, I’m not. Because I think Steve knows how good he is. He’s far enough along in his career that he knows he’s revered by people who write songs. Very diplomatic, by the way. (Laughs) But the point of that song…Steve’s been sober for a long time now, and he’s done a really good job of living his life according to that. And so it’s an acknowledgement that I’m not anywhere near where this guy is as a songwriter, and certainly not in my recovery. But I’m certainly a lot better than I was five years ago. Yeah. I was really hoping you’d rise to the bait there. Also, just to clarify one comment: my issue with “Outlaw Country” isn’t with any of the artists, it’s with the folks who use it as an easy/“cool” way to market and categorize artists. I don’t know too many artists who are actively seeking that label. I know Sturgill and Aaron Lee Tasjan for sure have poked fun at it in the past. That kind of marketing and categorization, to me, draw attention away from how great artists like Sturgill and Margo Price and Elizabeth Cook and those folks are individually, and makes it into this one homogenous category. It’s counterproductive. Their work is great, so let it stand on its own. Newlywed Kasey Anderson is on tour. Check dates here. 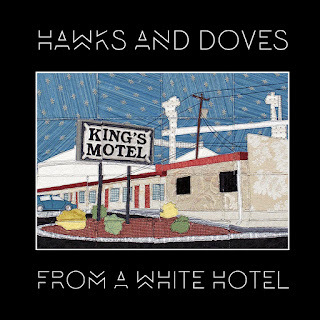 From a White Hotel is available everywhere today, including Kasey's site.